Place a rack in the middle of the oven and preheat to 350 degrees. 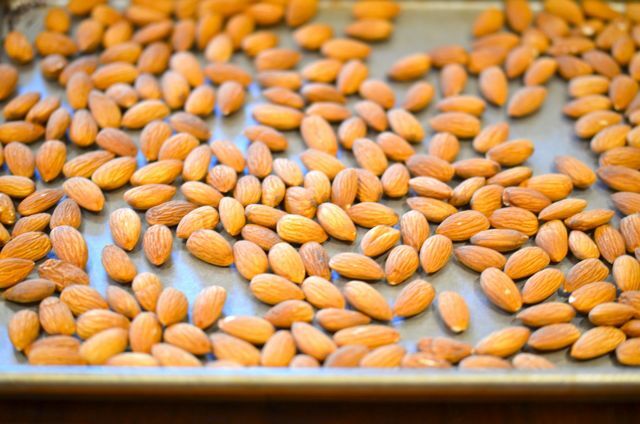 Place the almonds on a baking sheet and toast in the oven until they just darken, 5-10 minutes. Remove from the oven, let the almonds cool for 5 minutes. When cool, roughly chop the almonds and set aside. Meanwhile, wash and chop the kale and wash and shave / thinly slice the brussels sprouts. Drain thoroughly. 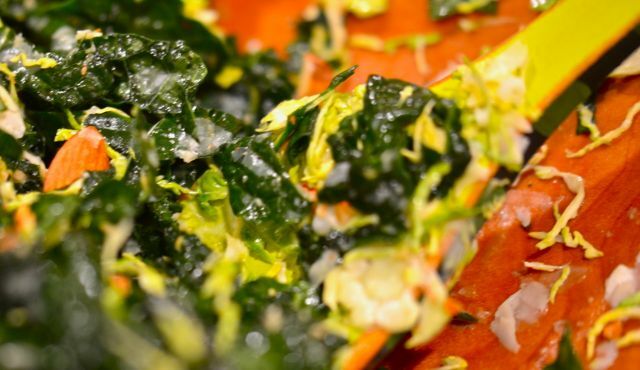 Place both the kale and brussels sprouts in a large salad bowl. 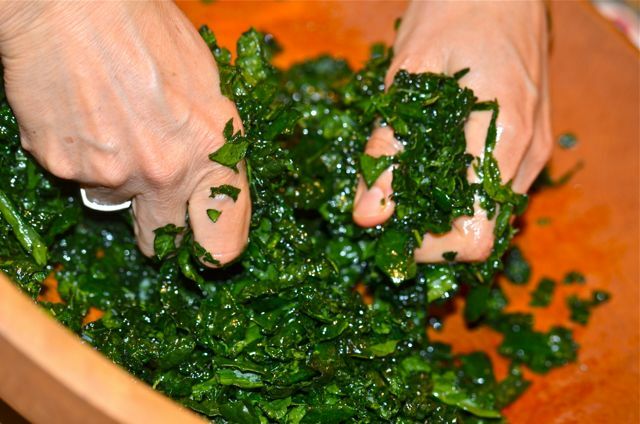 Add half of the lemon juice and toss the greens with your hands and “massage the lemon juice into the greens. 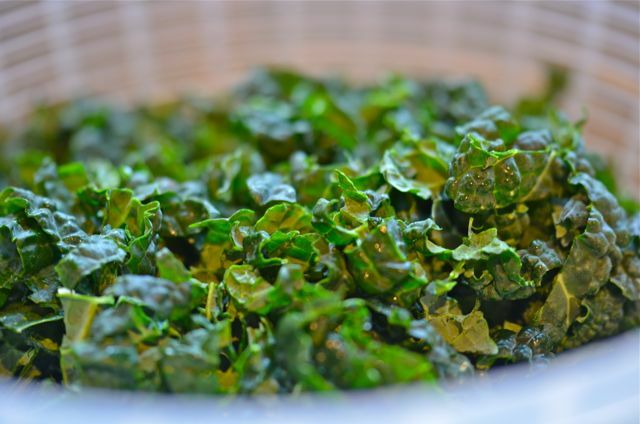 Allow the greens to sit for at least 5 and up to 20 minutes. Combine the olive oil, the remaining lemon juice and honey in a small bowl. Mix until well-combined. Season with salt and pepper. 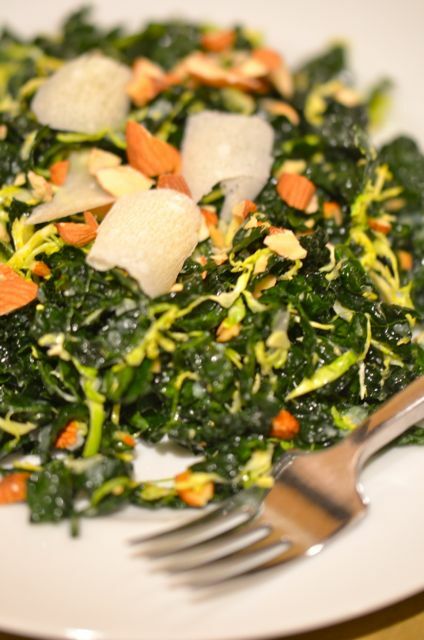 To assemble the salad, add the dressing, a few tablespoons of grated cheese and half of the almonds to the greens and toss thoroughly. Taste and adjust seasoning. Place some salad on serving plates, shave romano (or parmesan) cheese over each salad and garnish with the extra chopped almonds. Serve. this one look like a Keeper:-) What an awesome combination of ingredients. Healthy and yummyy–yeehaw! I’ve had a hard time finding ‘ clean’ Brussels sprouts lately, although I truly do love them ( even without bacon!). But kale, we have in abundance. This massage I have to try! Sounds like an excellent job for my Benriner. Thanks! Good explanation on how to do this! 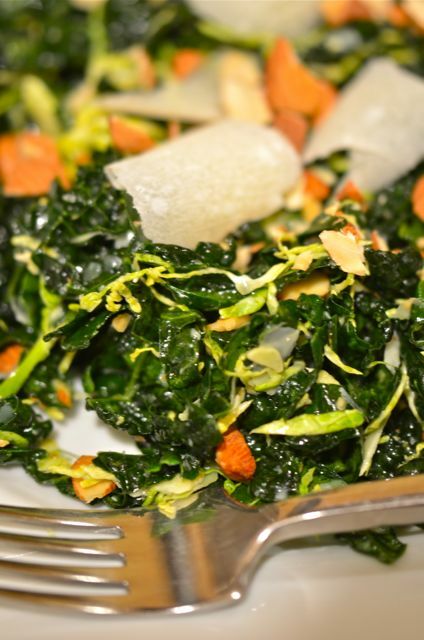 I enjoyed your descriptions of kale as “briny” and that brussels sprouts are sweet! Looking good and tasty as always – I going to do your curry today … so post will come during the week. Not a big fan of kale .. so this I pass on. Hope you have a great weekend. 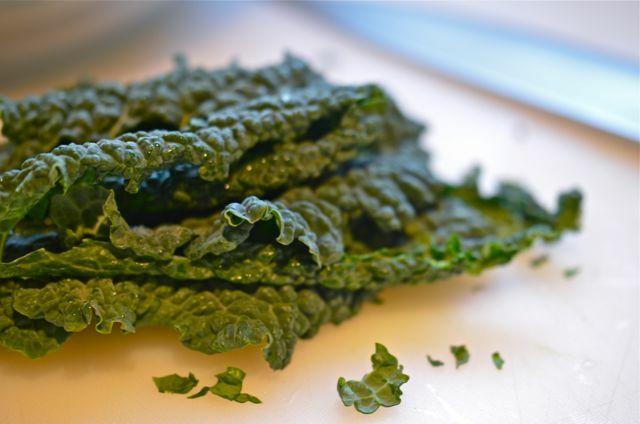 Kale is what it is…we are learning to enjoy it (as we can always gorw or get it locally). Hope you enjoy the curry! This salad looks delicious! 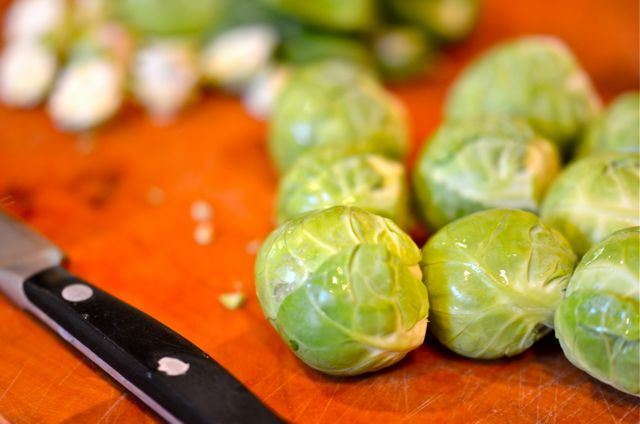 We love brussel sprouts roasted with a little olive oil and salt and pepper, too – so much better than steamed. Loving the sound of this, something else to do with Brussels – RESULT! Mind you I’ve recently discovered Brussels in salads (have yet to blog about them, tut, tut!) and am trult converted. Another of your recipes saved to my favourites file thank you! Thanks! We wised we liked the Brussels more, but we finally have a few recipes we like. Now if we could just grow them (no luck there at all, we get more aphids than sprouts).